SMART SPP – innovation through sustainable procurement promoted the introduction of new, innovative low carbon emission technologies and integrated solutions onto the European market by the pre-procurement phase of public tenders. Read about the guidance, tools and case studies produced here. 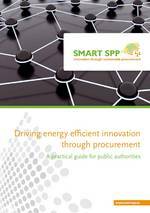 Driving energy efficient innovation through procurement - A practical guide for public authorities. This guide is aimed at assisting public authorities in becoming "innovation-friendly" - that is achieving the most innovative, energy efficient solutions within their procurement actions, particularly through increased dialogue with suppliers and producers. User Guide for the LCC-CO2 Tool (recommended to be used with the Excel tool). 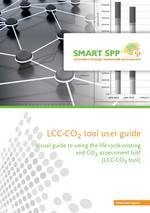 This User Guide accompanies the SMART SPP LCC-CO2 Tool. It has been produced to help you understand (1) what kind of information the tool can provide, (2) how to use the tool in a tendering process and (3) how the tool should be completed, and by whom. “Given recent economic conditions, we see more emphasis on life cycle costing. We also see more people asking fundamental questions about whether or not they really need to buy a product or service and if can they do without it. Simply not buying is sometimes (but not always) the greenest option.“ – Niels Ramm, UNOPS in UNEP (2013): Sustainable Public Procurement: A Global Review. Using the power of public procurement to encourage sustainable innovation, in terms of the goods and services purchased by cities and other public authorities was the central idea behind SMART SPP. The experiences from the project partners - the City of Barcelona (Spain), London Borough of Bromley (United Kingdom), Municipality of Cascais (Portugal), the Eastern Shires Purchasing Organisation (United Kingdom) and the Municipality of Kolding (Denmark) - were documented in a publication (published August 2011). SMART SPP public results report available now!